Join the discussion on our forums! Come discuss Dyn-o-matic over in our dedicated Dyn-o-matic discussion topic. Battlecry: Deal 5 damage randomly split among all minions_except_Mechs. Star player on the inter-office Boomball team. I find it funny that people play this guy in such automatic mode that they end up forgetting that his battlecry doesn't affect mechs. One guy learned that the hard way against me yesterday when he tried to use this card to clear my Mulchmuncher. He was apparently a little surprised as he took some time hovering over both minions to understand what went wrong. My favorite part about this card which I haven't seen anyone mention is his quote and voice from Borderlands 2 character Boom Boom. "Light the fuses.... expletives!" He has some great situational value especially with a 3/4 body. I find him most useful to play when you have no minions on the board. He can often clear a couple of small minions or pick off a solo x/5 or at least get a x/8 into trading range. I have also had good results playing him in a berserker enrage deck and in those situations works well when enemy minions can soak a couple points. As a flat 10 mana combo you can get 6 Patron on the board but with no other minions but even with no other minions its usually about 3 of them because RNG killing at least one of them. Not worth trying to hit grim with him if there are other minions, other methods are way more efficient. Probably one of the biggest surprises of this expansion for me. 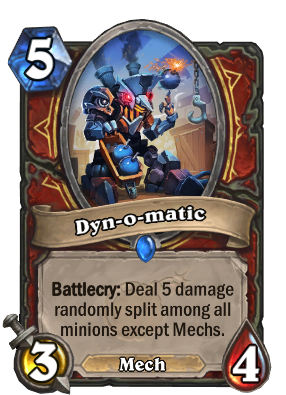 It even gets better after you activate Dr. Boom since it gets Rush on top of that battlecry, and the fact that it doesn't target mechs is a pretty big deal too. I liked it so much that I'm running two on my Odd Control Warrior. Potentially better than Bomb Lobber, and that card was pretty darn good. Good for warrior mech decks but also has a nice synergy with cards like Frothing Berserker and Acolyte of Pain. Using it for removal can be a bit iffy depending on the type of deck you are facing and state of the board but it's still a good minion. If the only thing on the board is a Blackhowl Tower, and machs, this is 15 damage to the face. In Wild you can turn an Axe Flinger into a combined nine mana Pyroblast to the face with this. The best part is that they're both on curve and decently suited to deal with aggro when the combo isn't applicable. Goblin Blastmage at one more mana, 2 less attack, and no activating condition. Since Goblin Blastmage was an above average value card, this puts Dyn-o-matic at a more balanced position. Being in warrior as well where it can hit your own minions that are not mech gives it a broader use. Could probably even compare it to Madder Bomber which puts it at two less attack, one less ping, but more focused in that it will only hit minions. So overall, I see it as being playable and close to very good. Past iterations are better from my perspective, but this does at least come close in comparison mostly because the ping damage is more focused. Even against mech decks it still has synergy with Acolyte of Pain. But only 3 classes got lots of mechs, so fairly often you will be able to deal 5 to enemies. Got it once during Wild Arena event... It was kinda bad in arena setting, I can tell you that much. If your board only consists mechs it is even better than a Spider Tank and Cinderstorm combined as it only deals its dmg to minions.